February 7, 2019, 11:56 PM · Happy Chinese New Year! The Los Angeles Philharmonic featured violinist Ray Chen at its annual Chinese New Year celebration concerts Wednesday and Thursday at Walt Disney Concert Hall, with the celebration set to continue Friday and Saturday with performances of Buddha Passion, a new oratorio by Tan Dun, composer for Crouching Tiger, Hidden Dragon. Like a lot of things in Los Angeles, this concert brought together an extremely eclectic mix, with Chen's performance of virtuosic violin repertoire by French composers joining several short East-meets-West pieces; a world-premiere Chinese opera piece by Du Yun commissioned by the LA Phil; and Ravel's "Bolero." For me and a good number of violin students, teachers and players in the audience, the big attraction of the night was Chen, a first-prize winner at the 2008 Menuhin and the 2009 Queen Elisabeth competitions who also has attracted a major following online with his comedy videos. 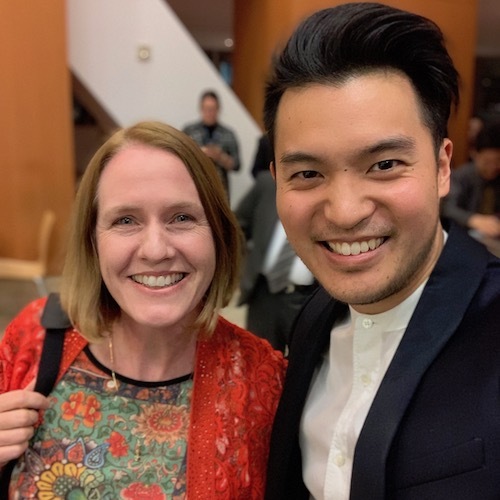 In recent years, Chen also has connected with young students locally with his master classes at The Colburn School and the Pasadena Conservatory, and a number of those students were here to see him again. Chen has recorded several albums, most recently his debut with Decca, The Golden Age, and he plays on a 1715 Stradivarius once played by Joseph Joachim. After a strong ovation Chen was back on stage to play a second show piece, Maurice Ravel's gypsy rhapsody, "Tzigane." The piece begins with the violin alone, and he shaped this long solo artfully, taking great care to coordinate as the orchestra joined in. Ah what yummy dissonances and picturesque music! Tinkly bells and harmonics give way to a Gypsy hoedown, after which it would seem that a drunken reveler stumbles through. The apotheosis at the end was incredibly exciting, accelerating to such a mad pace I thought the car might drive off the cliff -- but Chen made it around every curve and ended victorious. As an encore, Chen played "Waltzing Matilda" which he described as a kind of Australian National Anthem. As he spoke, Chen changed from his American accent to his more native Australian accent. Though Chen's latest CD, The Golden Age, features a quartet version of Waltzing Matilda, the version he played on Wednesday night was quite different, his own solo violin arrangement of the tune. It's was beautiful -- virtuosic in some parts, fiddle-like in others, and breathtaking as it melted into a tender song. After the intermission came the premiere of Du Yun's "Thirst," featuring two Diaoqiang Opera singers, Wang Ying and Zhang Tingfang. The piece combined a style of ancient Chinese opera singing with a modern use of the orchestra, emphasizing gesture and clamorous sound. While other pieces on this program might make for innocuous movie music, this one demanded much more of the listener. Diaoqiang Opera singers are trained from an early age to sing certain roles, and Yun's piece seeks to explore gender identity through a woman trained to sing the role of an old man and another trained to sing the role of a young woman. Both singers wore elaborately decorative costumes with the traditional very-long sleeves that play a role in the choreography of the story as they are spun and twirled. Singers wailed, keened, shook physically and gestured dramatically as the orchestra worked through myriad sounds with no tonal center. After An-Lun Huang's "Saibei Dance" and Liu Tieshan's "Dance of the Yao Tribe," the final piece on the program was Ravel's hypnotic "Bolero," that repetitive piece made famous by its appearance in the steamy 1984 movie starring Bo Derek. Full disclosure, I felt some dread when I saw this on the program, having heard (and played) it many times before. But I genuinely found it to be a treat with the LA Phil's standout woodwind section. From my seat at far stage left, I also had a perfect view of Matthew Howard, the percussionist who played the snare drum -- 15 full minutes of the same two-measure rhythm, incredibly exposed, for an eternity. This snare drum part, I realized, is even more taxing than the cello part in the Pachelbel Canon -- way more. The man was a hero, a boss - he did it flawlessly. After the concert it was time to see Chen, who was greeted by a line of fans that stretched the entire length of Disney Hall's downstairs atrium. "Please have your phone on selfie mode if you'd like a picture!" he told everyone, and taking each cell phone in hand, he produced a perfect selfie for each fan, in addition to signing copies of his latest CD, The Golden Age. Selfie: V.com editor Laurie Niles and violinist Ray Chen! Here is what the line looked like, and this was about 15 minutes into the CD signing, so it started out actually longer! February 8, 2019 at 05:05 PM · Yes, in the old days they would just have a photographer there to snap your picture with the famous person and then send it to you in the mail. For a fee, of course! LA Phil missing a fund-raising opportunity here. February 8, 2019 at 06:54 PM · Wonderful review! Fantastic photo of you with Chen! And, based on the people waiting for Chen's autograph, he's bringing young people into the concert hall. Bravo! February 8, 2019 at 07:30 PM · I agree with Diana, Laurie. You write very nice readable reviews. I get the sense of the night and the performances very well. Thank you. 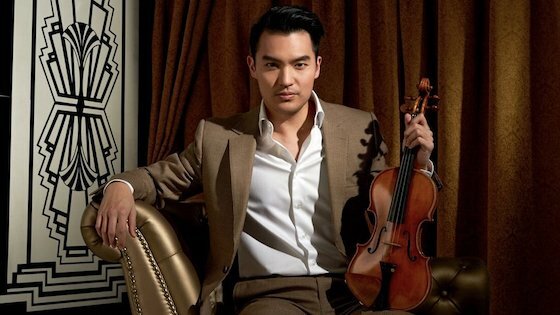 February 8, 2019 at 09:03 PM · This IS the golden age of violin! Thank you Michael and Diana!